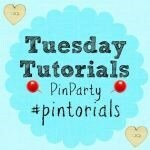 A huge welcome to Week 41 of the Tuesday Tutorials Pintorials Pin Party! Have you started your Christmas shopping yet? I am getting my children to write their Christmas cards for their classmates soon! This week I am featuring three different paint ideas. First up is from Mini Monets and Mommies who used fallen leaves to make finger paint art. Such a great messy activity! Next is Sunny Day Family who used decorative dry corn to paint colourful Thanksgiving placemats. Last but not least is Crystal and Comp who used hand prints to make a lollipop picture. Such a clever idea! Don’t forget to pop by to take a look at Kate (homemade advent calendar), Anna (Thanksgiving Printable) and Hodge’s (Leftover Halloween Candy) blogs to see who is featured this week.